1/3 payable at time of order placement; balance due before shipment. Payment accepted: Certified Bank Check or Money Order. We will start building the instrument once we have received the deposit and the funds have cleared. Satisfaction guaranteed, or return within three day trial period FROM DELIVERY, in perfect-as-shipped condition, (This includes all papers, warranties, included accessories, case and tags. If anything is altered or damaged the satisfaction guarantee will not apply and a refund will be declined.) for Refund, less original 1/3 deposit and shipping charges. 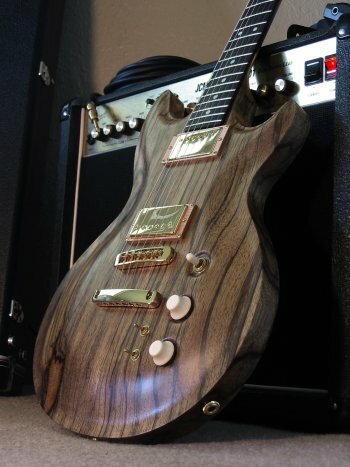 This satisfaction guarantee is for custom instruments built from our current model line with customary wood, hardware, electronic, inlay and finish choices. This does not include nontraditional, experimental or highly personalized instruments. For these types of instruments I cannot give any return guarantee, you must be responsible for your own design in these cases. I cannot guarantee that you will like your own design. If the instrument is to be returned, securely pack the instrument in its case and its original packing materials and ship PREPAID via UPS insured (for the full value of the instrument). Once we receive the instrument we will refund the instrument's price, excluding deposit and any shipping. Payment in full before shipping. Payment accepted: Certified Bank Check, Money Order. We will ship when funds have cleared. Satisfaction guaranteed, or return within three-day trial period FROM DELIVERY, in perfect-as-sold condition, (This includes all papers, warranties, included accessories, case and tags. If anything is altered or damaged the satisfaction guarantee will not apply and a refund will be declined.) for 100% Refund, less shipping charges. This is for instruments sold out of our shop only, guitars sold by our dealers are subject to their policies. If the instrument is to be returned, securely pack the instrument in its case and its original packing materials and ship PREPAID via UPS insured (for the full value of the instrument). Once we receive the instrument we will refund the instrument's price, excluding any shipping. We are required to collect sales tax for orders shipping to addresses in Washington State. All claims for sales tax exemption in Washington State require appropriate exemption documentation. Any state use tax due outside of Washington State must be remitted by customer directly to applicable state (Contact your state department of revenue for more information). *We are presently only shipping to locations in the U.S.A.
All EER Custom Instruments are warranted to be free from defects in materials and workmanship. This warranty applies only to the original purchaser of the instrument, for as long as he or she owns the instrument. All warranty repairs must be performed by EER Custom, or an EER Custom authorized repair person. This warranty does not cover repairs necessitated by normal wear and tear, misuse, neglect, accidental damage, modification, or cracking of wood or finish that results from changes in temperature or humidity. All transportation, insurance and freight charges associated with warranty service and repairs on EER Custom instruments are the responsibility of the purchaser, as is any service initiated for the purpose of customization or adjustments beyond original specifications. * Any instrument whose serial number is missing, or has been altered or tampered with in any fashion. * Normal wear and tear on any part of the instrument including jacks, controls and switches, worn frets, plated surfaces, tuning machines, pickguards, saddles and nuts, finish, etc. * Instruments which have been serviced by unauthorized persons or any unauthorized modifications or alterations made to the guitar or damage caused by same. * Defects in finishes, or cracks, splitting, or warpage of wood due to changes in temperature or humidity, exposure to sun, fire, moisture, body salts and acids, or other chemicals, and normal wear and tear. * Case and case hardware wear and tear. * All other defects and deterioration due to normal usage, wear and tear, aging, accidents, neglect, abuse, misuse, negligence, accident, improper use or acts of Nature. * Any requested customization or adjustments beyond original specifications. No other implied or express warranties are made including warranties of merchantability or fitness for purpose.